Wash Tank Capacity 15.4 gal. The Jackson AJ-80 single tank high temperature conveyor dishmachine can clean up to 248 racks per hour! With 25" of clearance, it is able to accommodate oversize sheet pans, mixing bowls, and other large kitchen items. A powerful 18" wash section uses specially designed upper and lower arms to effectively remove food soil, while a 15 kW wash tank heater helps maintain proper water temperatures. 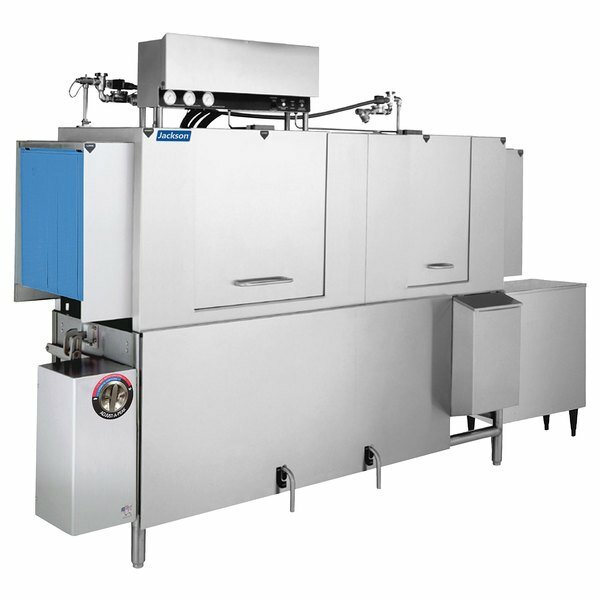 The Jackson AJ-80 conveyor dish machine features completely self-draining pre-wash, wash, and recirculating rinse pumps, and externally operated lever drains. Its exclusive "Energy Guard" system operates the machine only when a rack is being washed or rinsed, saving water and energy. The Adjust-A-Peak system allows the user to adjust the conveyor speed to quicken wash time for light washes, or slow wash time down for heavily-soiled loads. Other useful features include easy-to-use, exclusively electromechanical controls, standard splash shields on both ends of the machine to eliminate messes, heavy gauge stainless steel construction for increased durability, and an auto-fill feature. It requires a 208V, 3 phase electrical connection.